Posh boss Grant McCann acknowledges his club's fans at the end of the Millwall game. Photo: Joe Dent/theposh.com. Peterborough United manager Grant McCann was left to bemoan a frustrating night (February 28) as his side went down 1-0 at League One play-off rivals Millwall. A second-half penalty conceded by Anthony Grant and converted by Lee Gregory was enough to settle an even contest at the New Den. Posh striker Tom Nichols is tackled by Millwall's Ben Thompson. Photo: Joe Dent/theposh.com. Millwall now move into the final play-off place. They are five points clear of Posh who remain eighth. “It’s been a frustrating night for us,” McCann admitted. “There was nothing in the game all night. It was a match neither team deserved to win, but they punished a lapse of concentration and we failed to punish the mistakes they made. “Anthony Grant has held his hands up in the dressing room as he should have committed the foul much higher up the pitch rather than wait until the player reached the penalty area. “Millwall are a tough team to play against. They try and drag you into their long ball game and for 20 minutes it worked for them. They hit it long and compete for second balls. 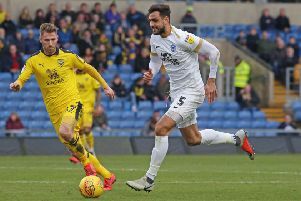 The 'outstanding' Ryan Tafazolli heads clear for Posh at MIllwall. Photo: Joe Dent/theposh.com. “We started off trying to play like them and we aren’t good at that. “But once we settled we were a match for them. We worked a few good opportunities, but didn’t manage to get on the end of them. “We weren’t good enough in possession though. Posh boss Grant MCCann is deep in discussion with assistant boss Lee Glover during the 1-0 defeat at Millwall. Photo: Joe Dent/theposh.com. McCann made just one enforced change to his starting line-up with Grant replacing suspended centre-back Jack Baldwin. Michael Bostwick dropped into the back four alongside the impressive Ryan Tafazolli. Club captain Chris Forrester was left on the substitutes’ bench until 15 minutes from time following his return from suspension. “I felt Leo Da Silva Lopes and Brad Inman did well in midfield at the weekend so I wanted some continuity in there,” McCann added. “I was pleased with how we performed defensively. Ryan Tafazolli was outstanding. Bradford city are fifth in League One, six points clear of Posh.